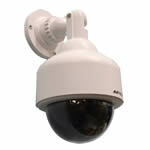 Professional replica CCTV camera for outdoor use, with a realistic power cable that provides an authentic look. 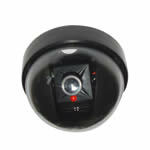 These replica security cameras provide a cost effective, maintenance free alternative to real security cameras. 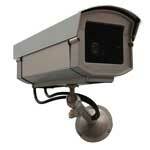 These cameras are modelled on real CCTV cameras giving them a close likeness to their real CCTV camera counterparts. 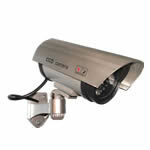 Because they look like the real thing they perform the primary aim of both replica and real video recording security cameras which is to deter crime. 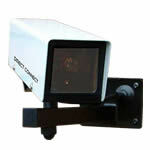 To add to their authentic look and provide extra visibility some of these cameras have battery powered flashing LED lights. Why not pick up a set of CCTV warning signs at the same time, designed to alert people to the CCTV cameras these signs can help prevent criminal actions before the cameras are even visible.